A good sofa brings a room and a family together for fun, comfort, and relaxation. We went ahead and researched the very best leather sofa brands available, to help you find the exact one you're looking for. The result is our top ten list of wonderful leather sofas below. Any one of them may be the perfect fit for your home or the perfect gift. Now: Before we get started, here’s what you need to look for as you shop. 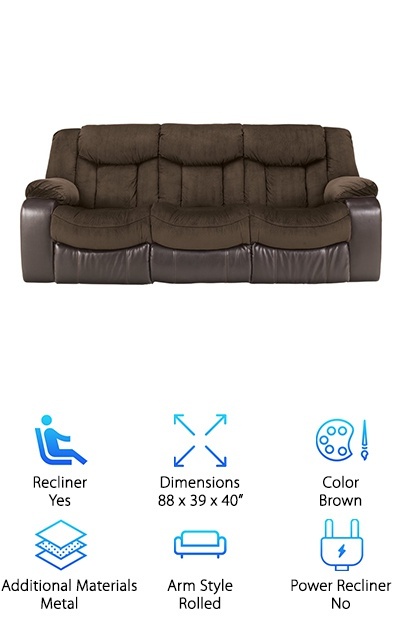 Recliner: Somewhere on this list is the best quality reclining sofa for you. 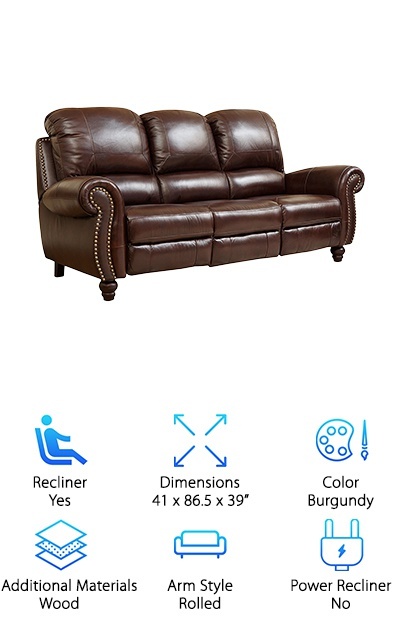 Right away, you will know if the leather sofa we selected has a recliner or not, so you can gauge how it will fit into your living room. Dimensions: Speaking of fit, the dimensions of the leather sofas we’ve chosen are vital. At a glance, you can check here to make sure the sofa you love will be perfect for your home office, sitting room or for entertaining guests. Color: Some leather sofas are vibrantly colored, while others are more sedate and elegant. When you picture your new leather sofa in your mind, you likely have a color or two already chosen. We’ll let you know what’s available! Additional Materials: Some leather sofas contain additional materials to create a particular look. Both wood and metal supports are not uncommon. We’ve marked those additional materials for you here, so you know what you get with your leather sofa purchase. Arm Style: There are three primary arm styles for sofas: Track Arms, Rolled Arms, and English Arms. Each will match the rest of your furniture differently, and provide a new feel for the room. We've marked the arm style for you here. 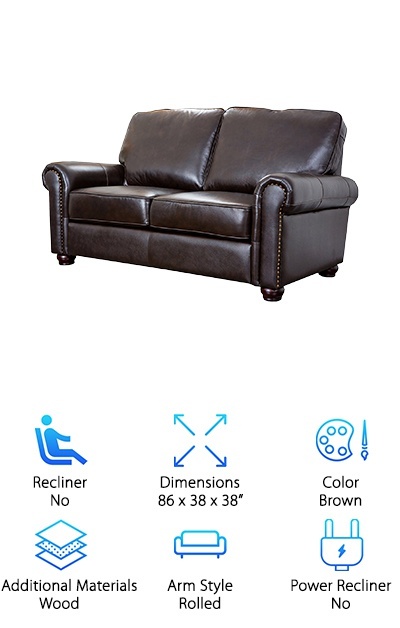 Power Recliner: Does the sofa’s recliner require manual leverage to recline, or does it go back at the touch of a button? We’ve included a “power recliner” category so that you know which type of laid-back seat you’re purchasing. 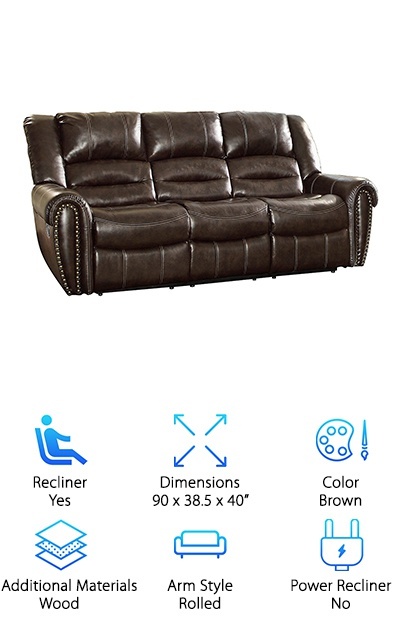 Now that you know how to choose a beautiful leather sofa, let’s get right to the reviews. Here’s the deal: If you’re in a hurry, just look at our top pick and our budget pick. Both are high-quality products, and they’re among the best of our top ten. Below those two, you’ll find the remaining 8 awesome selections. If you’re looking for the best leather sofas on the market, they’re on this list. Let’s get started! The Abbyson Reclining Sofa is one of the best reclining sofa brands we found, which is why our reviewers made it their top pick. Just look at this elegant piece of furniture! This sofa will provide a place for quiet, conversation and contemplation in any room of your house. It will also be a place to take a great nap because this sofa comes with not one but two reclining seats. Both are manually powered – just place the sofa 1 ½ to 2 feet away from the wall to allow the chairs to move backward. There's more: This sofa is made with premium-grade, top-grain leather. Many sofas out there will boast leather seating but will actually use a hybrid of fabrics or vinyl where you lay your head. The two-tone burgundy of this sofa will match virtually any furniture you’ve got, and provide a sense of old-fashioned refinement. You’ll also love the rolled arms and solid wood frame, meant to last. Our budget pick for the finest leather sofas around is the Serta RTA Palisades couch. This couch is made from refined bonded leather, and its chestnut-brown color glows with warmth. This is a 6.5-foot-long couch, and it will look wonderful in a family or sitting room. The bonded leather fabric is solid and easy to clean. Your seat is supported by a hardwood frame, memory foam and pillowed back cushions. Rest your limbs on the comfortable track arms on each side. Those square espresso-colored footers will keep this sofa feeling modern. One of the best things about our budget pick is the range of color and fabric options. Choose from fabric upholstery in gray, tan and beige. Chestnut brown is the bonded leather choice. It gets better: You’ll even receive a pair of decorative pillows with this very affordable purchase! If you need a new spot to put your feet up or binge on TV, this is the sofa for you. This fine leather sofa will roll into your home fully assembled and ready to go. The Ashley Damacio Sofa will provide you with a focal point in your home and a wonderful place to curl up with a good book. This is a reclining sofa, with simple and intuitive battery-powered controls. They give you multiple reclining positions, so you can go from "Just a little" to "Ah, that's the stuff" with just the press of a button. The leather seats, sides, and backs are all oversize and plush. Underneath, the cushions are filled with foam padding. The sides and back are covered in matching faux leather. You'll feel your troubles melting away as you take a seat. Or, you can also rest your head on those generously-sized rolled arms. Any position is a good position. This couch makes a great gift for college students, newlyweds, and others. This leather design will feel both contemporary and timeless in its surroundings. 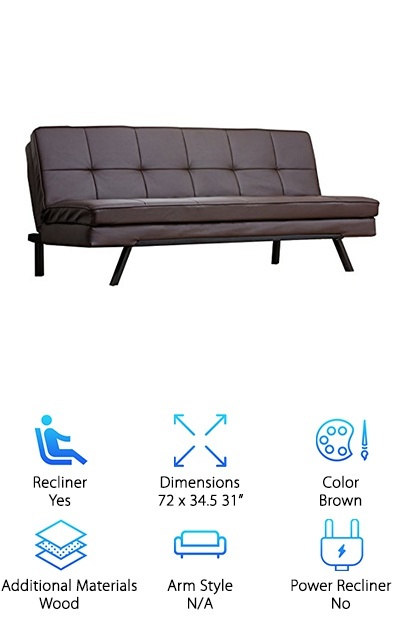 The Abbyson Convertible Sofa is unique because it will serve a dual purpose in your home. This is a beautiful sofa, with faux leather upholstery, solid wood construction, and foam-filled cushions. It is both lightweight and affordable, making it the perfect gift for someone who needs a good piece of furniture in their life. What's the best part? This convertible sofa converts to a bed! The sofa is attached to a sturdy wooden frame, which opens up and becomes a full-size space for sleeping. If you host guests regularly or need a convertible sofa in your office, guest bedroom or den, this Abbyson model is perfect for your needs. You’ll suddenly find yourself hosting all kinds of sleepovers. This sofa has a modern look, and the deep brown color will match its surroundings and enhance any setting. What’s the secret? The price! You’ll be happy with how reasonably you can acquire your brand-new furniture. Get ready to lounge in style. Are you shopping around for a living room centerpiece? Something that will invite people in and say “Welcome, this is where we live”? 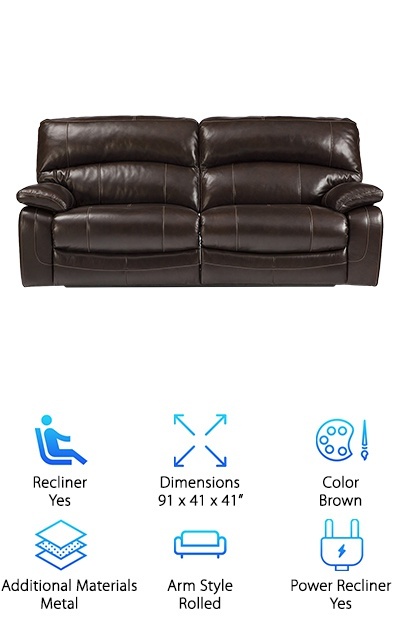 The Homelegance Reclining Sofa is one of the best reclining leather sofa choices. It’s from the Center Hill Collection. It's available in both a deep espresso brown and classic black. It is upholstered in bonded leather seating, with a faux leather body. The arms are in the traditional rolled style. Along the sides, you'll see a nail head accent mirroring the curved and cushy seats. This sofa makes an awesome purchase for all of those reasons, plus its versatility. It has two reclining seats! Here’s the scoop: Both seats recline with levers, so you can pop on the football game, grab some chips and dip and relax away the afternoon. This couch will become the meeting place for your family to catch up and share stories. You’ll be happy with your sofa, and everyone will admire your purchase. This sofa is a style icon in its own right. You will be amazed at its elegance and effortless modern bearing. 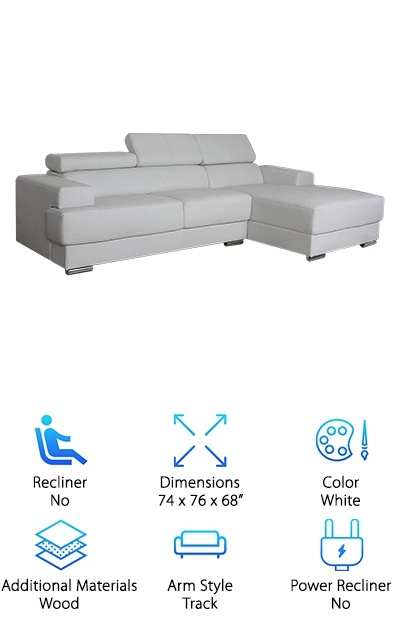 Here are the details: The US Pride Leather Sectional is crisp white, made from bonded leather and solid wood. 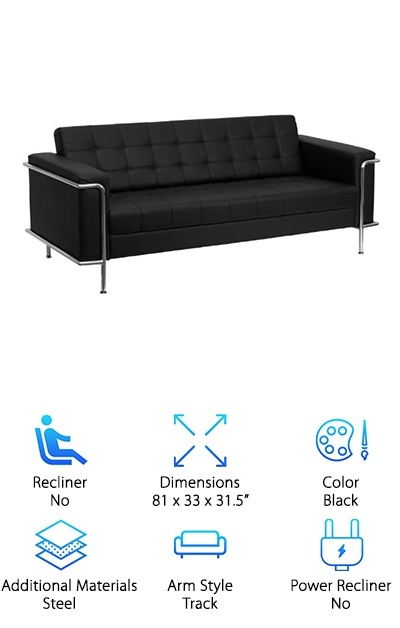 There is also an option for selecting a black bonded leather couch. It separates into two parts – the sofa portion, and the chaise lounge chair portion. Together, they measure over 6 feet in length. They can be moved into opposite sides of the room and angled toward each other, placed together, or in whichever other configuration works for your space. The framing is solid wood, and the legs are plated with chrome. The upholstery is filled with long-lasting PVC. Bonded leather is a unique material – it will be tight upon purchase, but will soften and become just slightly more pliable with use. This sofa is an open invitation to have a seat and engage in conversation. Check it out today! The loveseat is not the same as a couch, but it lives up to its name. It brings people who love each other closer together. While most loveseats are often smaller pieces of furniture, the Abbyson Wilshire Loveseat is actually longer than some of the sofas on our list. It seats two people on 22-inch-deep cushions upholstered in quality leather. The Italian leather will soften and develop a patina over time, adding even more beauty to this centerpiece. It measures over 7 feet long, so people of all sizes can find space to stretch out. The arms are done in the rolled style, so they are also extremely comfortable. This couch is supported by a wooden frame, with nail-head accents moving down the sides. The frame is kiln-dried hardwood, not laminate like some other versions. Bottom line: You’ll want to start a fire in the fireplace, pour a glass of wine and admire your excellent taste in design. If you want a leather sofa but still need the look and feel to be contemporary, this is the perfect couch for you. The Flash Furniture Hercules Lesley Sofa will make an ideal seat in a home, office, or business lounge. It will look like it belongs in a corner café, or on the side of a corporate meeting room. What’s great about contemporary furniture is that it will match your modern accessories and ones that aren’t so modern, either. Classic black is available, or there is also white, a blue-tinged gray, and a truly unique burnt orange. The colors are rich and inviting. The seats are tufted and filled with foam, and the legs are integrated stainless steel. You might be wondering: Won’t a professionally appointed leather sofa be out of my price range? One of the best things about the Lesley Sofa is its affordability. This couch is the perfect fit for the home or business setting! The Ashley Reclining Sofa is on our top ten list because it is the ultimate in enjoyment. What do we mean? You will sink into this couch and never want to leave. You can even sleep on it if you'd like because both the left and right-hand seat recline backward. The middle seat remains stationary. The recliners are controlled with easy-to-use pull tabs. This sofa was created with a dual-fabric design which helps increase your comfort level, too. The upholstery and seating area are covered in plush, nubby polyester. The exterior is covered with a vinyl fabric for a sophisticated look. Both the seats and the footrests are supported by an inner metal framework so that they last through plenty of use. 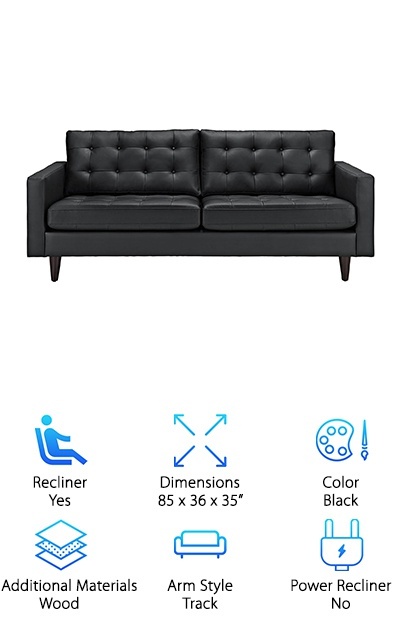 With very minimal assembly required, this sofa will be in place and ready for lounging in no time, ideal for virtually any room of your house. It’s time to try a new look and relax with the Ashley Reclining Sofa! There is a perception – a false one – that the only leather sofas are available in black or brown. This could not be further from the truth! Our best example is the Modway Empress Modern. It comes in nearly a dozen colors, including a sophisticated mustard yellow and a blue-gray that will match ocean swells. As the name indicates, this is a midcentury modern couch, with arms done in the track style. It is perched upon tapered wooden legs that have caps added at the end to prevent marking up your flooring. The Empress will fit into many rooms with contemporary and modern furnishings. It would also not look out of place in a black and white film noir. Its design is timeless, measuring over 7 feet long and nearly 3 feet wide. Check this out: The Empress collection is an affordable way to make your friends think you hired an interior designer. Give your room a makeover and upgrade your look!